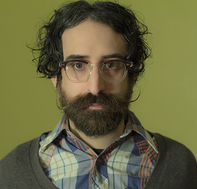 Michael J. Epstein is a Somerville, MA-based filmmaker and songwriter/musician. His debut feature film (co-directed with Sophia Cacciola), TEN, a surrealistic, post-exploitation exploration of identity, is currently on the international festival circuit and has been featured in CURVE, Fangoria, DigBoston, and The Boston Herald. His music and music-video work has been featured by TIME, USAToday, and SPIN and has appeared in numerous TV shows and video games (Dance Dance Revolution, Rock Band).